Garden Blog - What Kind of Soil Should I Use in my Containers? It’s just about time to haul your containers out of storage and fill them up with gorgeous color for the new season. Growing plants in containers is easy because you can give them just the right amount of soil, moisture and nutrients they need in a controlled environment. 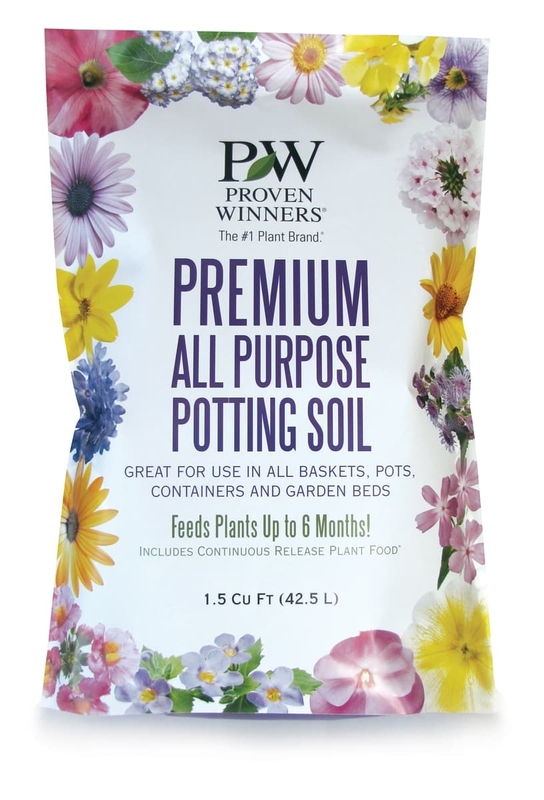 We recommend filling your clean containers with a fresh batch of Proven Winners premium quality potting soil every year. This lightweight blend is made of peat moss, soft wood bark and perlite with a dose of continuous release plant food. 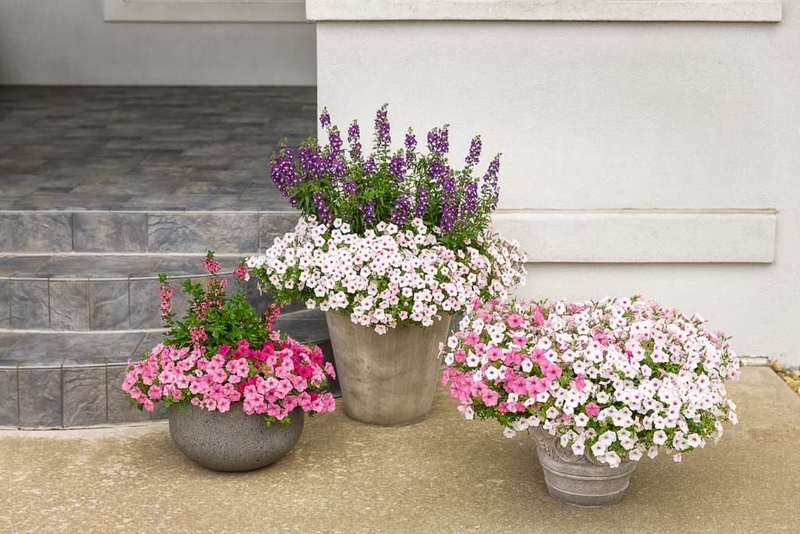 It works well for all kinds of annuals, perennials and shrubs in containers. We don’t recommend using garden soil for your containers because it gets even heavier and harder for roots to grow in through the season. Potting soil has a much looser texture that makes it easy for roots to push through. Can I reuse the soil from last year? Many people ask us if they can reuse the soil in their containers from year to year. We don’t recommend it for the reasons I’ll describe below. But if you must, at a minimum you’ll need to add more continuous release plant food to it before replanting. Are we just trying to sell you more potting soil? We’re really not! We’re looking out for the best interest of your plants and we want you to have the best container gardening experience possible. Should I put stones in the bottom of my container? Another very common question we get is whether you need to fill your containers all the way up with soil. If it is 16 inches or less in diameter, we recommend filling the whole thing with potting soil. We do not recommend filling the bottom of pots this size with stones, pot shards or some other filler material because it is simply not good for your plants. If you could see inside the container, you’d notice that the plants’ roots continue to grow down into the filler material where the water tends to pool instead of draining freely out the hole in the bottom. Eventually, this leads to rotting roots and disease issues. It’s better for your plants to fill the container all the way up with potting soil to give them the space they need to spread their roots and reach their full potential. This is especially important for plants with large root systems like perennials, ornamental grasses and shrubs. 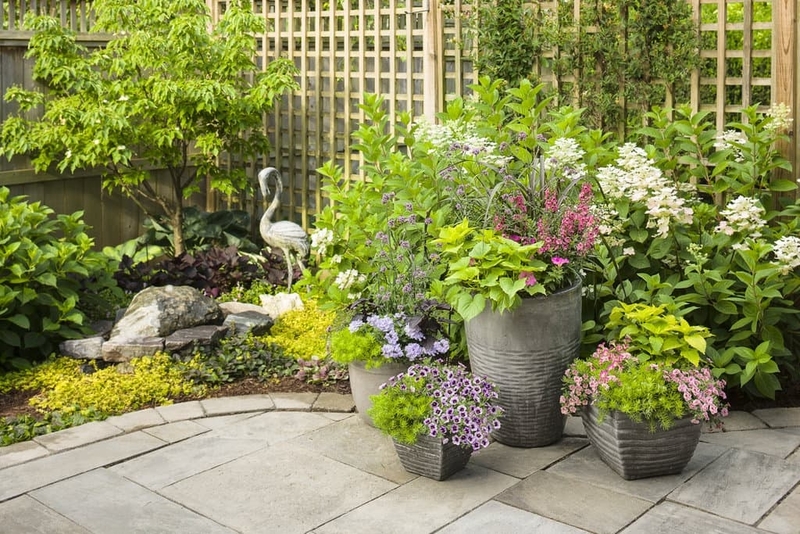 If you’re using a very large container to grow your annuals, like a columnar one that is several feet tall or is bigger than 16 inches in diameter, use a planter insert like this to reduce the weight. A bag of high quality potting soil is relatively lightweight. If it takes all your strength to lift, it’s probably too heavy for your containerized plants to grow well in. Usually when a container is very heavy it is not because of the weight of the potting soil, but because of the container itself. Choose plastic, metal, fiberglass or resin composite containers instead of clay ones if you’d like your containers to be lighter weight. Want to learn more about growing annuals in containers? Check out this article.